Emails leaked exclusively to Breitbart News reveal a group of Google employees, with encouragement from the tech giant’s director of monetization, began plotting the downfall of this website shortly after the 2016 election. 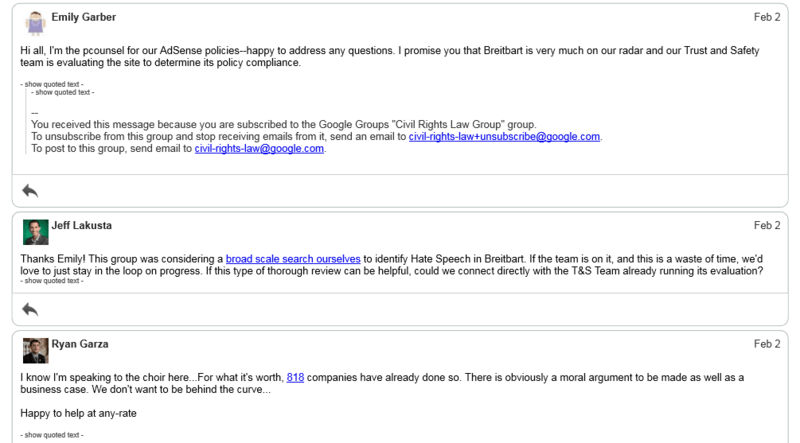 In the leaked emails, Google employee Richard Zippel advised a fellow employee that Google would act against Breitbart News “at the site level” if sufficient examples of “hate” were found. This kicked off a concerted effort to find evidence of “hate speech” on Breitbart. Another employee, David Richter, then forwarded Zippel’s email to his colleagues, urging them to scour Breitbart for examples. Of course, according to the far-left definitions used by Silicon Valley, even the term “illegal alien” can be categorized as hate speech. According to LinkedIn, Richter is now a technical lead at Google Cloud Storage, where he oversees privacy and security. The comment, made in February 2017, was little over three months since left-wing media kicked off the fake news panic – allegedly over Macedonian bloggers publishing genuinely fake articles for clicks and ad revenue. Gray’s statement confirms that in Silicon Valley, conservative media was a prominent target of the fake news panic from the very beginning. For these Google employees, the chosen method of attack was Breitbart News’ ad revenue – which like most websites on the internet, makes use of Google’s ad services. Gray’s enthusiasm to deplatform Breitbart News also raises questions over how he managed YouTube, where he also directed monetization according to his LinkedIn profile. His time in that role overlaps with a period of widespread complaints about the unfair removal of ad revenue from political channels on YouTube. Instead of challenging the transparently political (the internal discussion group was labeled “resist”!) effort to demonetize the web’s leading conservative website, Gray instead sought to reassure the group that action was being taken. Using the jargon-rich corporate talk beloved on Silicon Valley, Gray hinted at efforts underway at Google to make it easier to strip ad revenue from inconvenient websites. The discussion was then joined by Jeff Lakusta, head of technical support for Google’s ad buying software. Inviting colleagues to join a collaborative project, Lakusta said it would be “tough” to prove Breitbart is hate speech only a “thorough” approach would result in Google demonetizing the website. As Breitbart News previously reported, Lakusta would later follow up his efforts by co-authoring an open letter to Google’s management, demanding that Breitbart News be demonetized. Later in the discussion, employees directly involved in the policy area chimed in, including a member of the legal team for AdSense, the Google platform relied upon by many digital publishers for ad revenue. “There is obviously a moral argument to be made as well as a business case,” chimed in another Googler employee, Ryan Garza. Emily Garber later returned to the discussion thread, where she confirmed that the anti-Breitbart spreadsheet had been passed to Google’s trust and safety team. Earlier this year, Breitbart News revealed that a cabal of employees in Google’s ad department were directing the company’s ad clients to the page of Sleeping Giants, a far-left organization that attempts to deplatform conservative media organizations – including Breitbart News – by spreading slander to their advertisers. In the same report, Breitbart News revealed that Jeff Lakusta, Pierre Fite-georgel, and Tim Chevalier had authored an open letter to Google’s management formally requesting that Breitbart be demonetized. It now appears that the letter was the tail-end of a long process within Google to smear Breitbart as a place for “fake news” and “hate speech,” that began mere months after the 2016 election. Google holds a dominant position in digital ads, accounting for 42.2 percent of the market in 2017 – more than double the share of its closest competitor, Facebook. 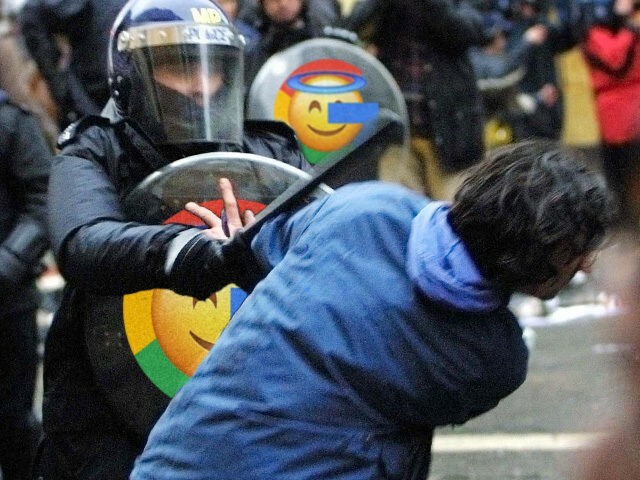 Being kicked off the service would be a major financial blow for any website – which is no doubt why Google’s famously far-left employees worked so hard to make it happen. We have extensive and very well publicized policies for publishers who choose to monetize with Google ads. We enforce these policies vigorously, consistently and without any political bias. We regularly and routinely review sites in our ad network to ensure compliance with our policies. These emails from early 2017 simply show the AdSense team explaining that such a periodic review was underway. Google did not answer Breitbart News’ more specific inquiries, including whether the company has any formal internal safeguards against internal bias. Read the full leaked discussion below.